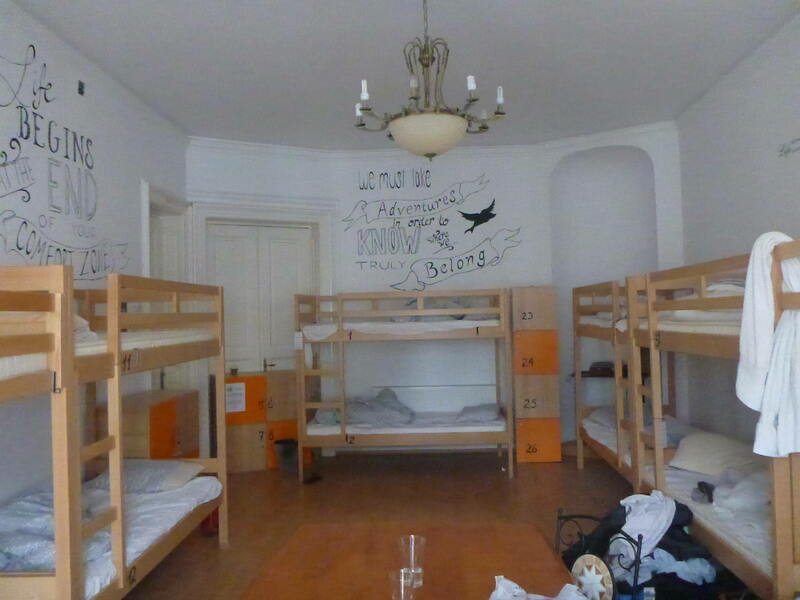 The Little Bucharest Hostel, Romania. I loved looking at maps as a kid and one of the first things I checked out when I arrived in Romania, was where I was, where I could get to next and the approximate routes I would take. Romania’s location became instantly nostalgic. 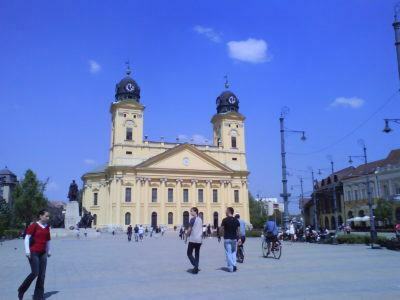 I glanced over at the Hungarian city of Debrecen, which is close to the Romanian border, the one I had visited back in 2009 when in love with local dancer Noemi Linzenbold. I thought of the day we saw the road sign for Romania. 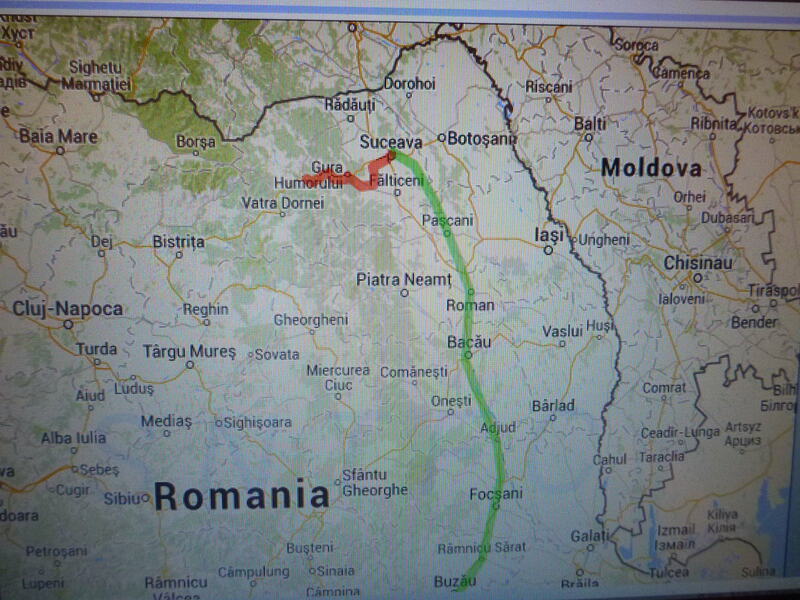 I had been close to Romania one day, but now here I was. A part of me couldn’t help think of her and that day. But I placed the thought at the back of my mind and at the same time decided I wouldn’t visit the west part of Romania at all. Tinged by the memory, it couldn’t have been a good idea at all. Every time I’d see a road sign for Debrecen, something would strike in my brain again and I didn’t want that. Backpacking in Debrecen, Hungary – the Nagytemplom. So I first looked far north, and the area known as Bucovina, which is north east and the largest cities are Suceava and Iasi. Having read about the tremendous UNESCO World Heritage Site Monasteries, I decided to head there. 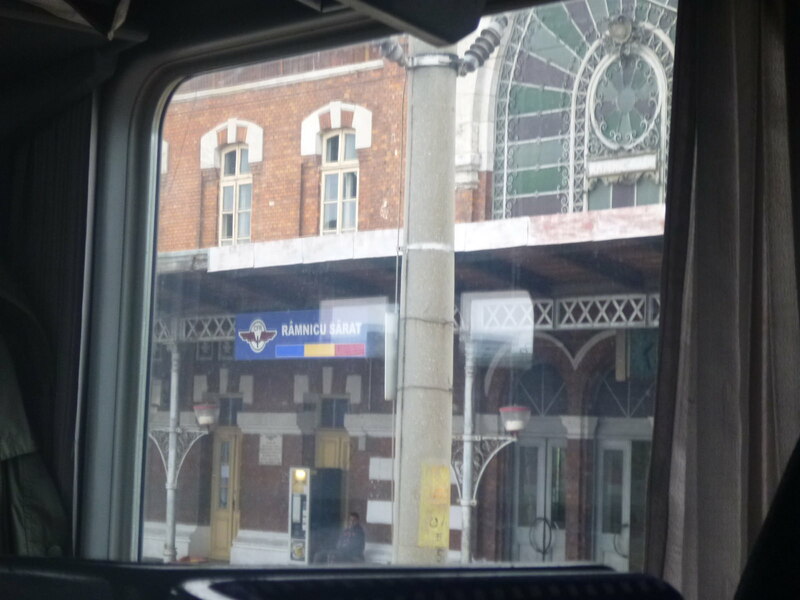 It was a double train ride from Bucharest with a choice of day or night trains. 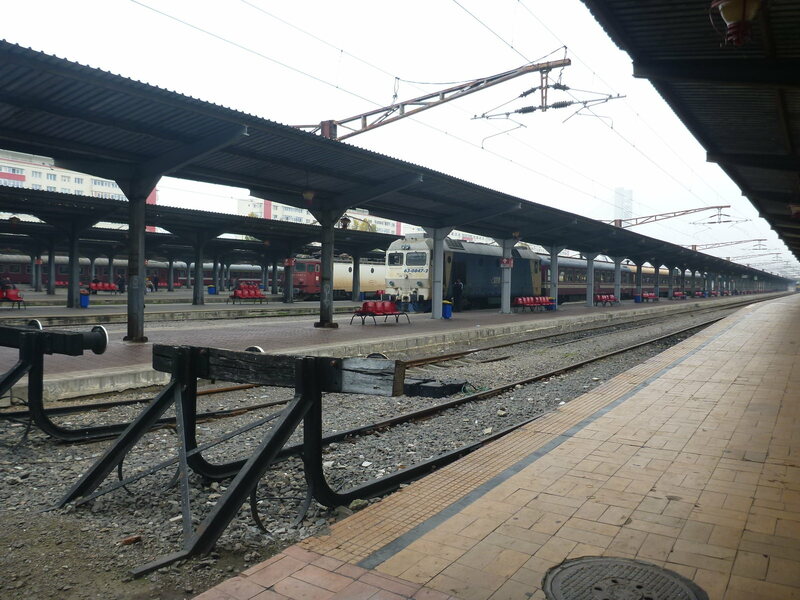 This time I opted for day trains, so that when I got there, I could sleep straight away and get up early the next day ready for the touring. Dor de Bucovina Hostel in Campulung Moldovenesc, Romania. 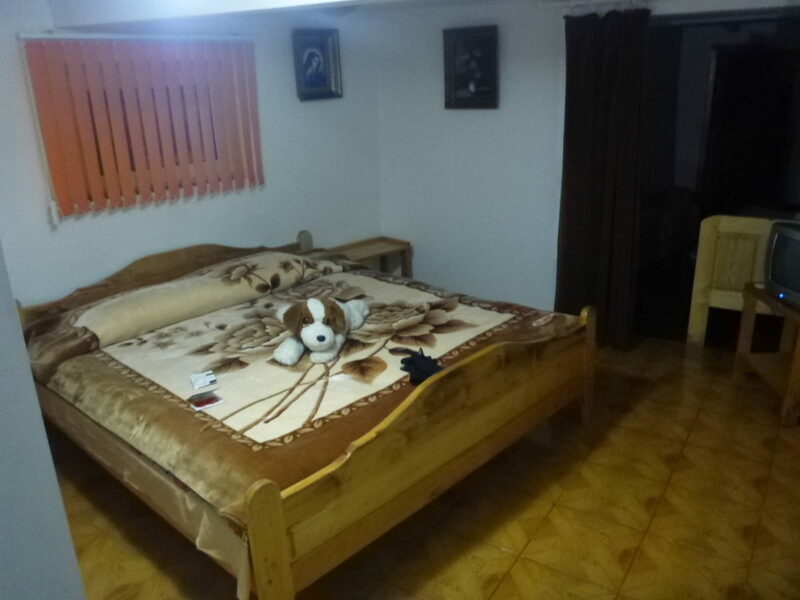 I found out about the Dor de Bucovina hostel which is run by the Pura Vida Romania Hostels group – the best hostels group in Romania. 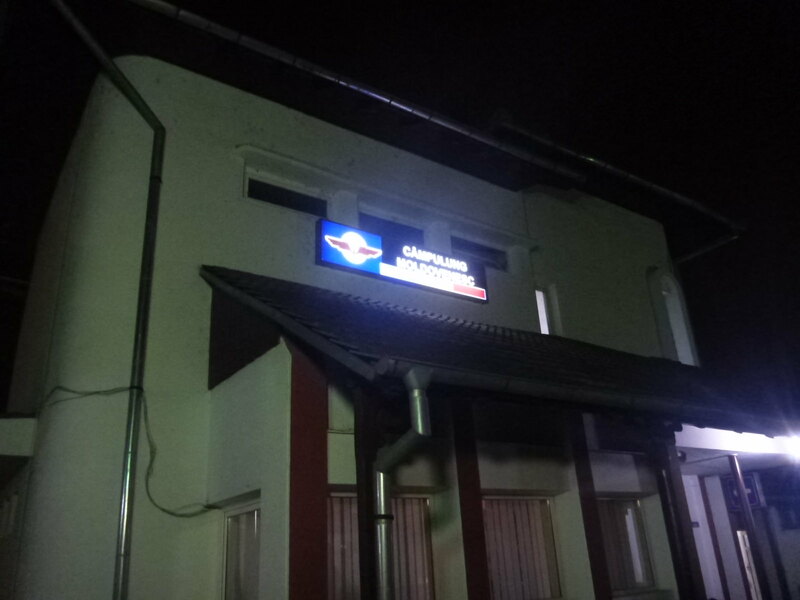 The Dor de Bucovina is based in the town of Campulung Moldovenesc, which handily enough has a train station. 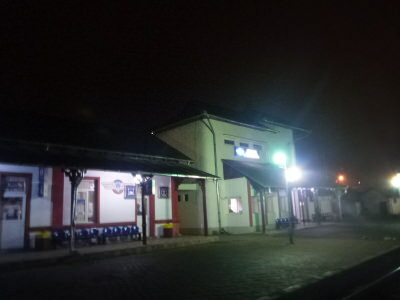 Train station in Campulung Moldovenesc. 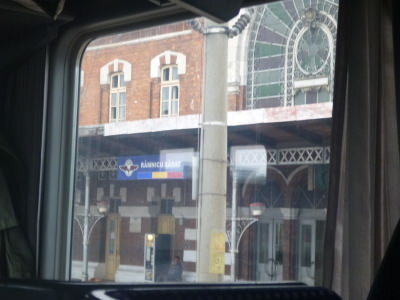 So I headed from the Little Bucharest hostel in the Old Town, on the metro at Piata Unirii in Bucharest to Gara de Nord. On arrival at Gara de Nord, I headed to the ticket office, which is on the corridor on the right before you get to the McDonalds on the corner. I needed a double ticket. 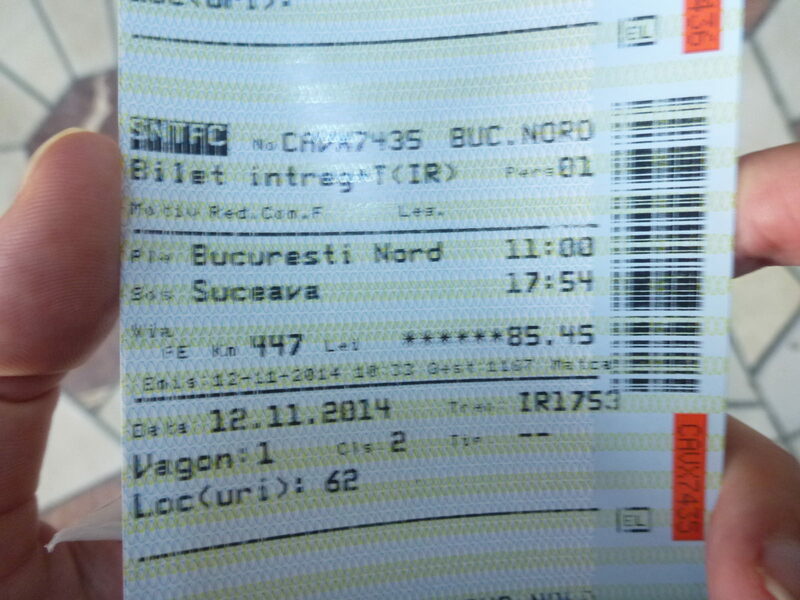 The first would be the 11 am train from Bucharest to the city of Suceava, due to arrive at 17.54. At Suceava I’d then have to wait until the next train to Campulung Moldovenesc, which was at 19.28 and should get into Campulung Moldovenesc at 21.27. The lady at the ticket office understood it all and I’m not sure why but there was a discount on each ticket (maybe as I was buying last minute – trains were due to leave just 20 minutes later) the total cost being 95.35 Lei (85.45 for the first trip and 9.9 for the second). 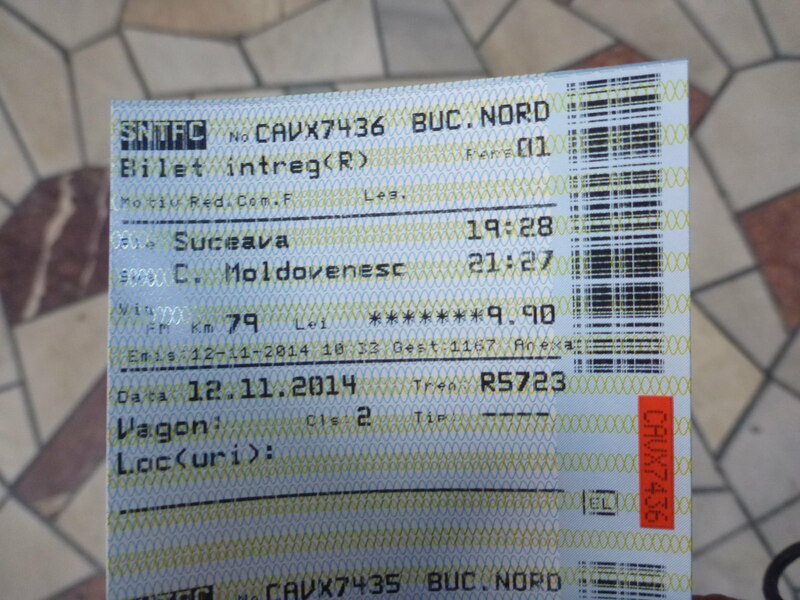 Train ticket from Suceava to Campulung Moldovenesc. 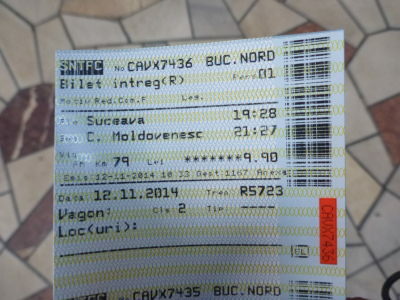 Train ticket from Bucharest North to Suceava. 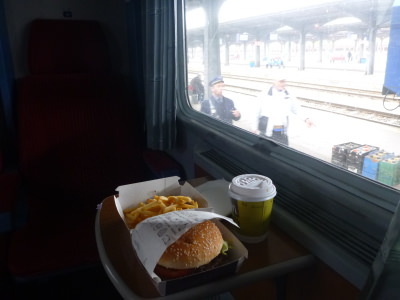 I then had time to grab some more food and drink and head for my train, which the screen showed as departing from platform 6 and on time. Bucharest Gara de Nord station. Unusual for me, but I opted for a hot McDonalds! I thought no queues, it’s fast and why not so I went inside to find a different type of McDonalds menu as it’s one of the countries that sells beer with McDonalds meals. I decided on a Big Tasty meal with a coffee though. The cost was 20 Lei (£4) not that cheap but I wanted hot food for my lunch, and later I would enjoy the massive pre made sandwiches in my bag (cheese and salami) for dinner. With bottle of beer for 3 Lei, I grabbed one of those too – I was travelling light for a change as I’d return to Bucharest and had left my big bag there! 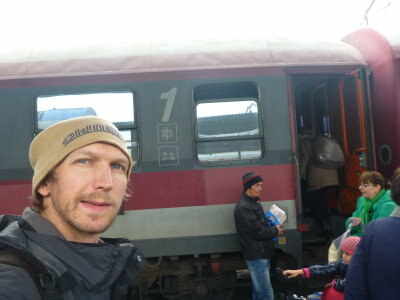 Boarding the train in Bucharest. I boarded the train on carriage 1 and went to seat 62 my seat. It was a great seat. Only one other guy on the section opposite and 4 free seats out of the 6. Plus a table and I was relaxed. I remembered how much I love train journeys – the memories of that train to Baku, the overnight Mashhad train, the long train journeys through China down the years and the Western Wilderness Railway which I wrote about 10 articles on. My train seat at the start of the journey. 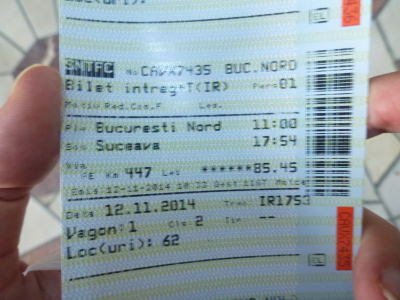 The train left on time at 11am from Gara de Nord and within 20 minutes, Bucharest was a distant memory. I made a note of some of the stops and times along the way, but not all of them. After leaving Bucharest, one of the guys came and gave me a free local newspaper. That was cool as it had a page on sport, particularly football and a preview of the Romania v. Northern Ireland match, well it was in Romanian. 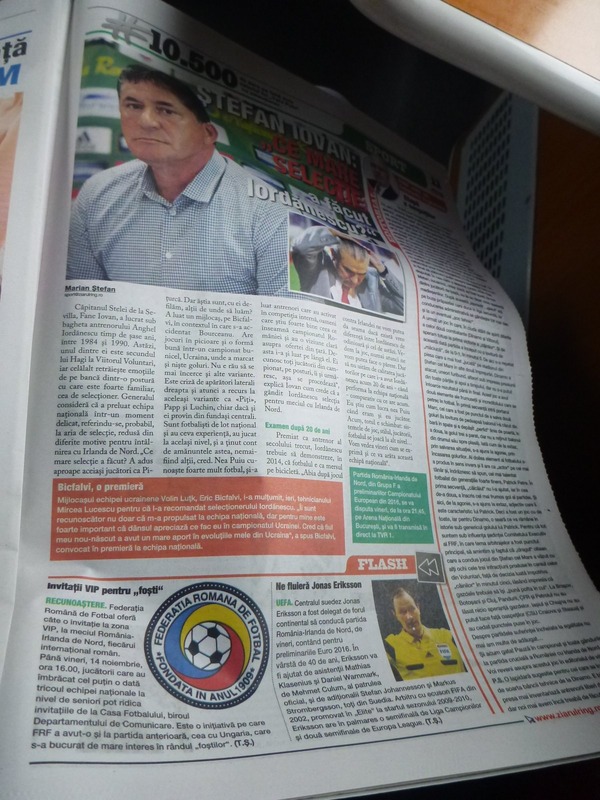 Newspaper with Romania v. Northern Ireland match preview. Then there was the ticket check. I was pretty sure I was in the right seat, but the conductor told me I wasn’t and that I should move. What I didn’t know was that carriage 1 had a section 1 and a section 2 and that I was seat 62 in section 2. By this time I had finished my coffee and my McDonalds. 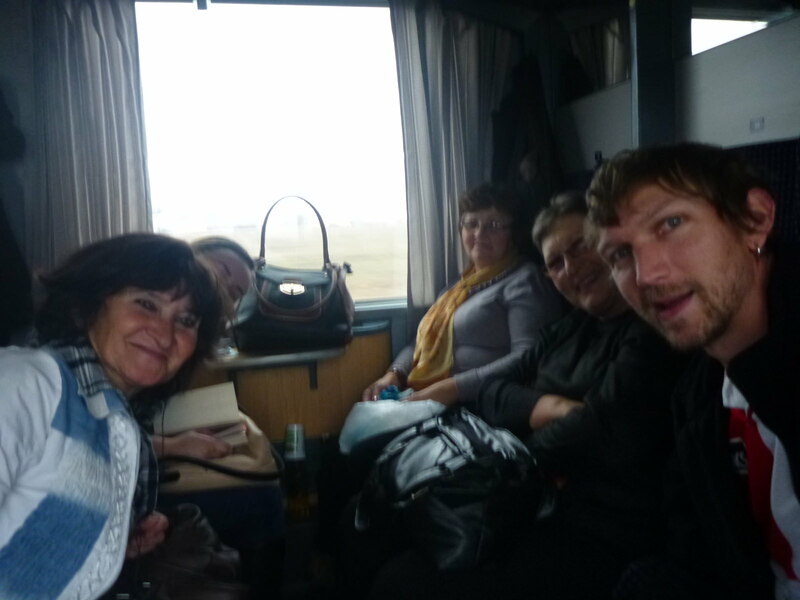 With the local ladies on the train in the correct seat. So off I went to the correct seat, which was in a set of 5 seats this time, but filled with 4 local ladies and me. For the record, I was the only tourist on the train, and also the only one I saw that whole day. In fact when I got my new seat (my real seat), I wondered why the guy had moved me as this seat seemed better! It had a comfy head rest and only 5 people in a section instead of 6. 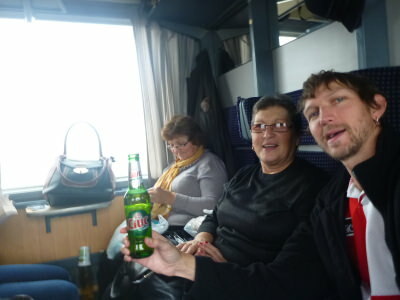 Having a beer on the train and chatting to the local ladies. The ladies were interested to chat immediately. It is not often they see foreigners in their lives and 2 of them spoke a bit of English. French and Spanish worked too and we intertwined the languages until we understood each other. The ladies were Anika, Jetta, Maria and Andrea. All Romanian and all had boarded in Bucharest, heading to Suceava. None would be connecting with me all the way to Campulung Moldovensec, which I assumed would be a remote town and a lonely journey – yes it was. Another stop on the journey at Ramnicu Sarat. 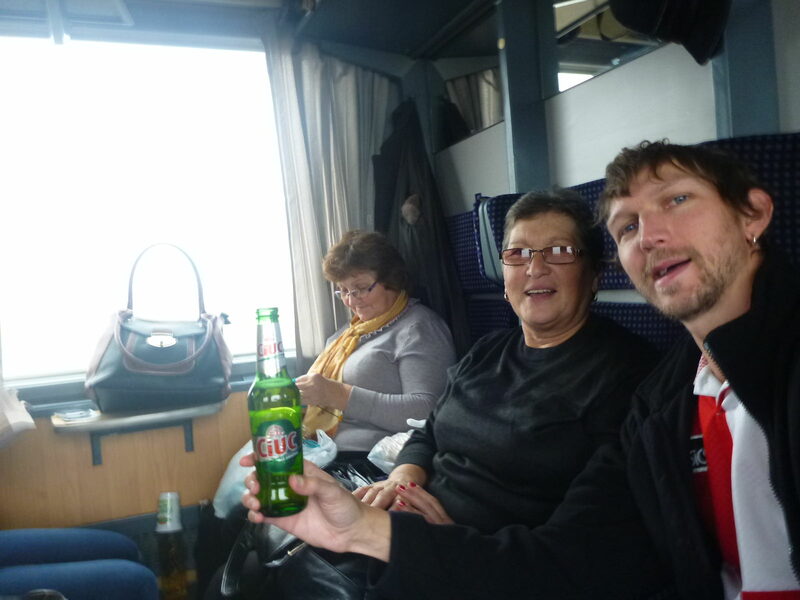 We chatted about all sorts of things, I opened my beer around 1pm just before we reached the city of Ramnicu Sarat. I then listened to my iPod for a bit, updated my travel notes and then the ladies asked me if I wanted to try their coffee. I took a sip and liked it – strong, rich and yet cold coffee. 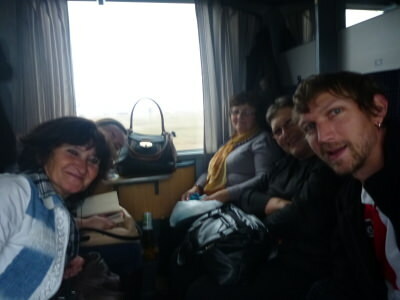 Within minutes I was asleep and relaxed on route to Suceava. 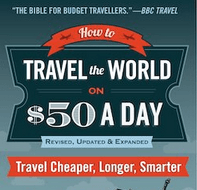 Mid afternoon I woke up, read my travel guide book and ate the first of my bulky cheese and salami sandwiches. 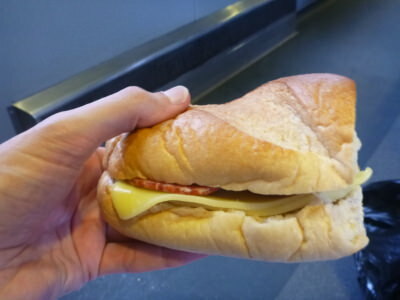 The first of my cheese and salami homemade sandwiches. Darkness fell on northern Romania by the time we passed through Pascani and it was here that I said farewell to Jetta and Maria – you just know those travel moments are over. We enjoyed our chats on the train, Jetta also kindly gave me some tissues on the trip (I was blowing my nose a bit) and we said our goodbyes. 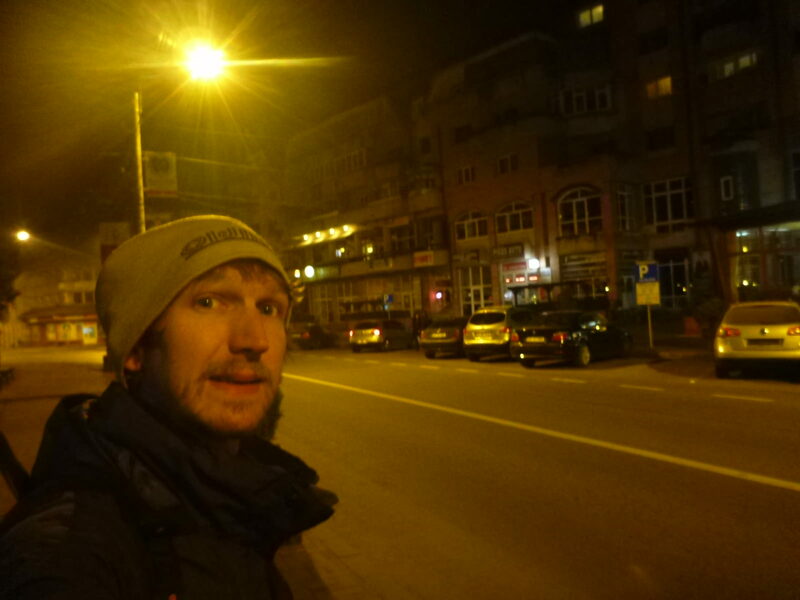 By the time we arrived in Suceava, a typical Eastern European darkness was in evidence. 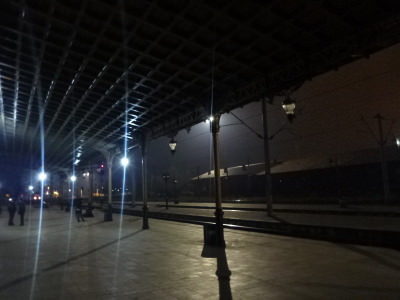 You know the type – no lights on at stations. Everything dark and grey. Barking dogs. Not many places open. Barely a street light. Local people know their way in the dark. Station workers and porters shine their torches everywhere. I said goodbye to Anika and Andrea at the station and saw a shop and a cafe so I popped in. 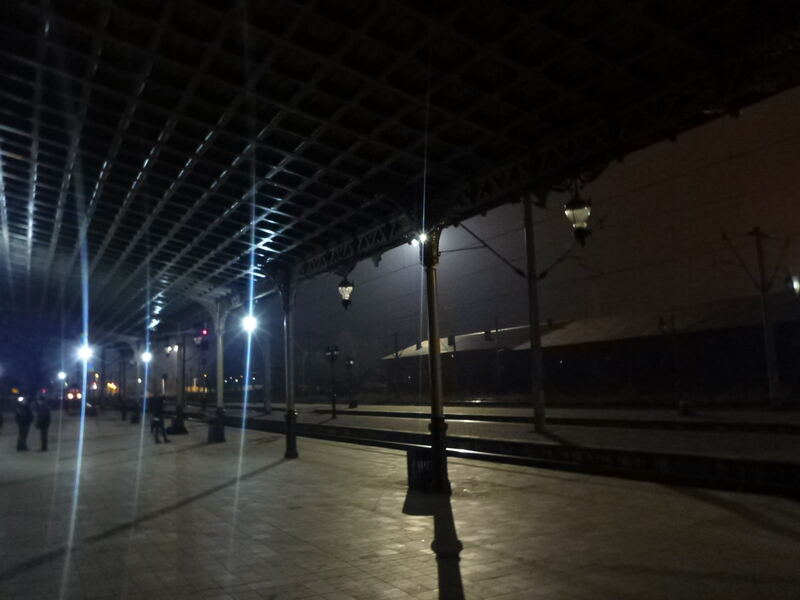 Darkness on arrival in Suceava. 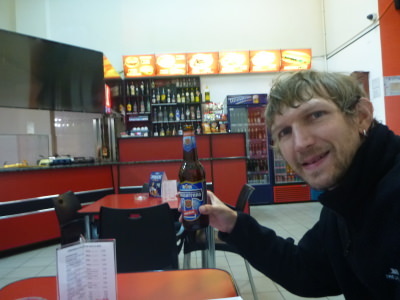 At the start I was the only customer, and I ordered a Timisoreana Beer in a bottle – it was only 3.5 Lei (about 70pence). Cold and fresh and as I sipped it the place got busier. Romanian bars are smoky and I don’t smoke. I don’t enjoying smoking or the smell it brings. But alas it was warmer inside so I stuck it out. The station had free wifi so I used the opportunity to get online for a bit, message Panny and my Mum and also Narcisa from Pura Vida hostels who had sorted out my accommodation and was checking I knew the way to the next hostel (Dor de Bucovina) The bar was crowded by the time I left and as the beer was so cheap I decided to buy one more for the train journey or for later (as it happened I didn’t drink it until the following night). Waiting in Suceava having a Timisoreana beer while I wait on my train. As the time approached my second train had appeared on the screen as leaving platform 1 at 19.28 pm. I waited there and a train arrived. 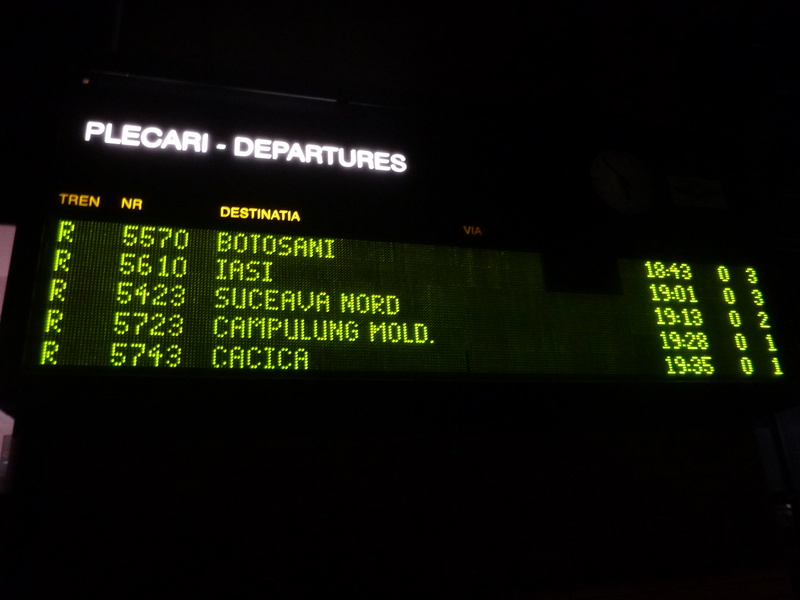 It was 19.20 pm now so I got on the train, assuming that to be the correct train to Campulung Moldovenesc. My train listed on the screen to Campulung Moldovenesc. I found a compartment with a local girl in it so I sat down and asked her just confirming I was on the right train (I always confirm just to be sure). It was lucky I asked her as this was the wrong train!! So I hopped off quickly and made a dash for the other train that was on platform 1 – yes there was one parked further up that I didn’t see. This was the right train!! It was leaving first at 19.28pm, the one behind me was for somewhere else and would leave at 19.35 pm. 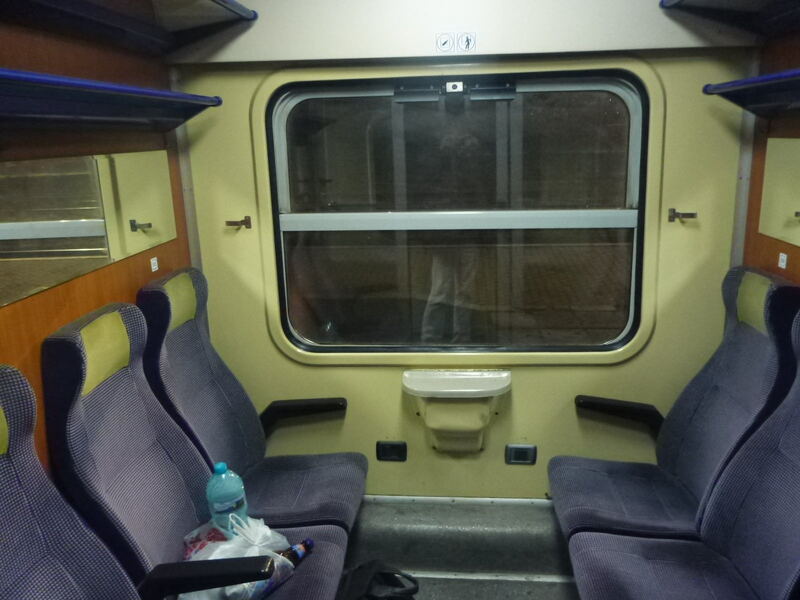 I was now on the right train and found a compartment of my own to sit down in. 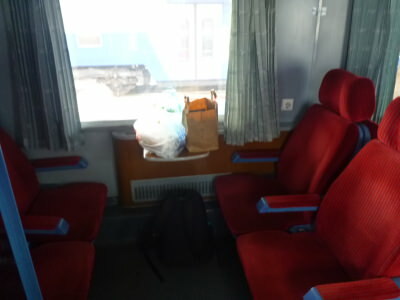 My compartment on the correct train to Campulung Moldovenesc. I munched the second sandwich, sipped my water and realised I was getting tired. The journey up to the mountains took around 2 hours and it was dark and stale when I arrived (with at least 2 other passengers – both locals) in the town of Campulung Moldovenesc. Eerily quiet, dark and deserted as I arrive in the town of Campulung Moldovenesc. There were dogs on the station approach and derelict dogs seem to be a theme in Romania. 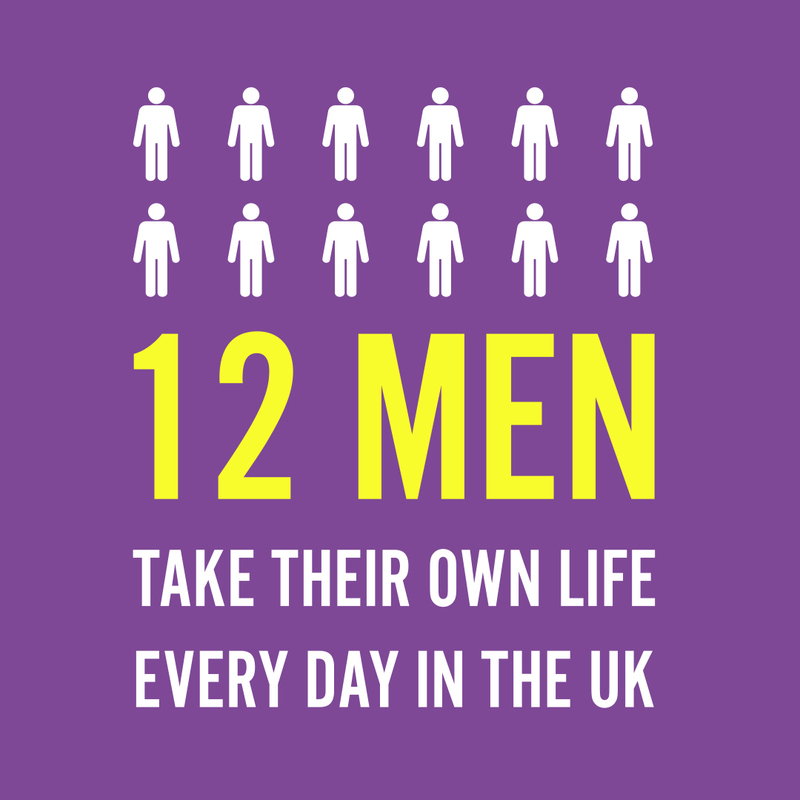 However there were nowhere near as many as I was warned about in advance. I had taken a photo of the map from Google Maps on how to get to the hostel and for once, it was easy as I assumed. I headed onto the main street in Campulung Moldovenesc and walked all along it out of town to the college, after which I took a right down the lane by the river to 8 Simion Florea Marian Street. Walking all alone in the darkness of Campulung Moldovenesc. It was so dark and the streets are badly lit that I saw the sign advertising the hostel but not the hostel itself. I asked a local guy in his garden amid dozens of barking dogs and he told me it was next building on the right. It was pitch black but I found it, and got checked into my excellent room at the Dor de Bucovina. I met Gabriella the hostel owner and was given an introduction to the area and hostel. We spoke in a mixture of French, Spanish and English to understand each other. That was all my fault – I knew no Romanian apart from thank you. My room at the Dor de Bucovina Hostel in Campulung Moldovenesc. 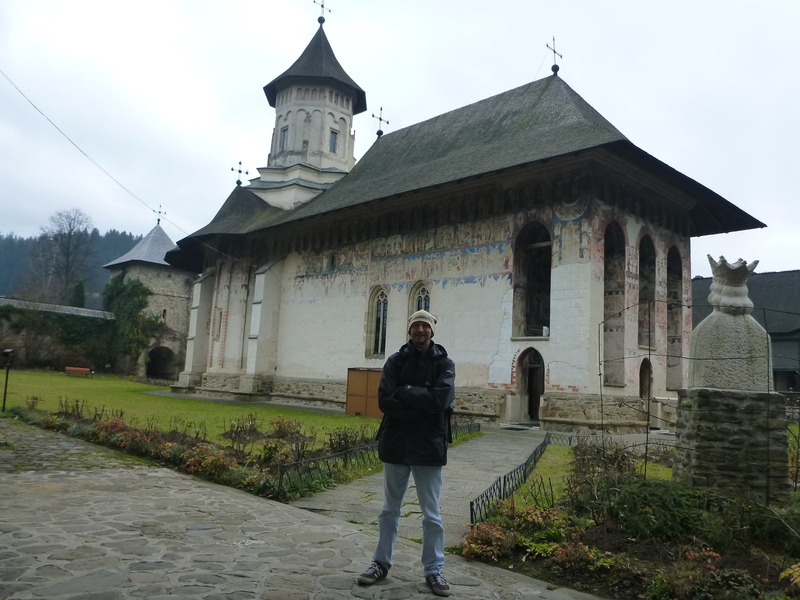 Touring the amazing colourful painted monasteries in the Southern Bucovina region. This place is Sucevita. 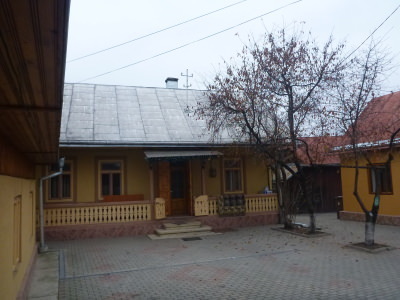 This entry was posted in Bucharest, Campulung Moldovenesc, Europe, Romania. Bookmark the permalink. One of my favourite things about travel — meeting locals and trying to break the language barrier. The Romanians sound like my kind of people — hospitable, friendly, and curious/interested in others. Glad you asked about the second train, though! 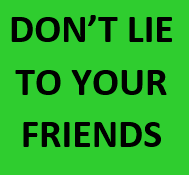 You almost had yourself another “The Day That I …” story!